Located on the Atlantic shore of the state of Virginia, NASA facilities at Wallops Island were originally built in the 40's with the aim of testing rocket powered vehicles. The first launch was carried out on 4 July 1945. Since its inception, and until 1957 Wallops served as a test ground for new aircraft design, including rocket propelled crafts and also pilotless ones. The test models were subjected to higher speeds than achieved on wind tunnels at the time. Later, between 1958 and 1974 and under NASA operation there were tested some vital components for the development of the first manned flights as well were also made several sub-orbital launches even carrying small satellites. Then, until 1981, these activities have been expanded to also cover land and ocean studies, as well using the airport Wallops in studies to reduce noise associated with the surface air activity. In 1982 after being merged within the structure of the Goddard Space Flight Center, it becomes head of the agency's suborbital program. The site currently has a total of 6 rocket launch pads and also counts with all the mobile infrastructure needed to perform those same rocket launchings from anywhere in the world. Wallops also concentrates the administration of all NASA programs related to sounding rockets, stratospheric balloons, tracking and orbital maintenance and operation of scientific airplanes. Regarding the launch of stratospheric balloons, the use of facilities at Wallops has been very limited. The first reference is not found until 1969 when the Cambridge Research Laboratory, which was then in charge of balloon operations for the Air Force used the base to perform two balloon flights within the framework of a project to obtaining land imagery from the stratosphere. There are other references in the literature about some isolated missions during the 80's and finally two launches during a campaign in the mid 90's which involved the participation of several educational institutions of Virginia with NASA support. All these launches were carried out from the airport, located next to the main base. 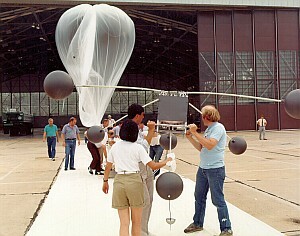 Since then the Wallops Flight Facility was not used again as a balloon launch base.